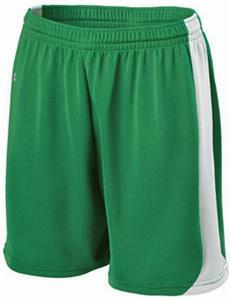 Holloway Ladies' Finisher Softball Shorts - Closeout. Dry-Excel Defend Pin-dot Performance Knit, polyester. Ladies' engineered-fit. Wicking and soil-release. Covered elasticized drawstring waist. Top Selling Item. WAIST 24" 25" 26" 27.5" 29.25" 31.25"
HIP 42.5" 44.5" 46.5" 49.5" 53" 57"
LOVE THESE SHORTS, NOT TOO SHORT, VERY COMFORTABLE, FIT TRUE TO SIZE, WOULD PURCHASE THESE AGAIN.